• On Palm Sunday we wave ʻpalmsʼ in remembrance of Jesusʼ procession into Jerusalem. We cry ʻHosannaʼ (in Hebrew meaning ʻSave Us Now). What is your expectation of God ʻsaving usʼ. Are you willing to let go of a strong military power figure and allow a ʻsuffering servantʼ? What do you think happened in the minds and hearts of the crowd gathered to eventually cry ʻcrucify him!ʼ? 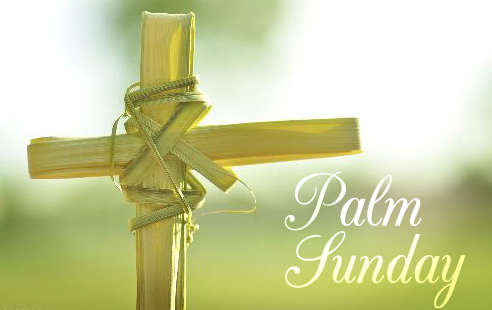 • Palm Sunday is also called ʻPassionʼ Sunday as we listen to the whole story of Jesusʼ personal betrayal by his disciples, his court appearance before religious and political rulers, his rejection by previously welcoming crowds, his cruel whipping and torture by soldiers. Watch, listen, feel the violence. Where does such cruelty originate from in the world? Why do you think the world seek a ʻvictimʼ? • Jesusʼ sufferings ʻunmasksʼ and reveals the worldʼs violence and cruelty. Jesus responds peacefully in interrogation. Heals a soldier’s ear. Asks the Father to forgive. Welcomes criminals to heaven. Commits his spirit into the hands of the Father. Is Jesus a ʻdoor-matʼ or a ʻsaviourʼ? Explain how? • It may be a surprise to learn that Jesus and his disciples were regarded as a bunch of revolutionaries from Galilee, hanging out in parks, carrying swords, wanted and hunted by police. How would such a group be considered today? • Where would you place yourself in this drama of the passion. With Peter? With the pious religious authorities concerned about the unrest and political problems caused by revolutionary activity? • The crowd is pictured as watching this spectacle and beating their breasts in sadness as they returned home. But ʻhis acquaintances stood at a distanceʼ. How could you stay present to this Holy Week? You may wish to find out the Holy Week timetable and reflect on the readings before each of the ceremonies. • What is one action that you will do to ʻlivethewordʼ this week? The Feast of Christ the King was initially assigned to the last Sunday in October. In 1969 it was moved to the last Sunday of the Year to highlight the eschatological (end times) importance of Christʼs ʻKingshipʼ. Would you consider yourself ʻreadyʼ today to meet Christ the King? David was anointed and made ʻKingʼ of Israel. But many people in Israel did not want to be like other nations and have a ʻKingʼ. They wanted to have only ʻGodʼ as their ʻrulerʼ. They were cautious of taxes, abuse of power, wealth and excess that often went with earthly ʻkingdomsʼ. David is invited by God to be first a ʻshepherdʼ of people before being a ʻcommander of Israelʼ. What does this show us about God and leadership? Paulʼs letter to the Colossians today is an ancient baptismal prayer. Imagine the baptismal scene. Thankful. Being given an inheritance. Transferred from living in darkness to light. Redeemed (returning back to your true family, purchased back from slavery). Forgiven. All of this has happened through Jesus – who makes the ʻinvisible Godʼ visible – the ʻikonʼ / image of God. What word in this baptismal prayer teaches you about your baptism? The mystery of Christianity is revealed as it worships itʼs Lord and King today. Instead of a scene of a throne indicating power and authority and judgment, we have Jesus crucified on a cross giving forgiveness. The way Jesus reveals Godʼs ʻkingshipʼ is radically different from the worldʼs power, wealth and honor. Imagine being in the crowd contemplating Jesus (or pray in front of a crucifix!). What questions are stirred up within you? What answers does God reveal to you about leadership. Salvation. Sin. Your life? Are you not the Christ? Save yourself and us! The promised ʻChristʼ (Messiah / Saviour) was supposed to be a strong military leader. Instead Jesus is tortured and dies at the hands of Roman soldiers. Yet mysteriously the soldiers refer to him as ʻthe chosen oneʼ, the ʻChrist of Godʼ, the ʻKing of the Jewsʼ. The scene is gruesome, but with the eyes of faith the reality taking place is ʻgloriousʼ. 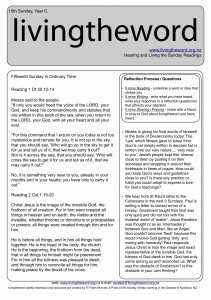 How would you explain Christʼs death as ʻgloriousʼ? Our human nature demands visible signs. We want to know with our own eyes that God has ʻsavedʼ us, forgives us, loves us. How does this crucifixion scene reveal the powerfully hidden way that God is able to work out (y)our redemption? Is God afraid of the mess of our ʻhumanityʼ? Are you? The Church places before us the paradox of Christ the KING. Instead of a royal procession, Jesus rode a donkey. Instead of a scepter of power, Jesus held a towel. Instead of a throne, Jesus was lifted up on a cross. Disciples replaced an army. Thorns replaced a golden crown. Mercy was his judgment. Humble homes his palace. Meals with sinners his preference. Humble sacrifice of life instead of the military sword. We, the Church, are called to exercise this style of ʻleadershipʼ and reflect his ʻimageʼ in the world today? How does this challenge you in your lifestyle? Leadership? Good Friday – what has happened on the cross? Take some time to enter the celebrations of Holy Week. Each ceremony has much to teach us. Download: Good Friday Readings – We kiss what we love. In this ceremony we kiss and show reverence to the Cross upon which Jesus suffered and died to establish the sacrifice to take away the sins of the world. Reflect on the video and the readings and make this event move from the historical to the personal. The Procession into Church with Palms and singing ‘Hosanna’ marks the beginning of Holy Week. Palms were symbolic of victory. Hosanna comes from the Hebrew word ‘Save us now’. Riding on a donkey was the animal of choice in ancient times for Kings-to-be, portraying peace (rather than a horse used for battle). Placing cloaks on the road in front of the donkey was the ancient equivalent of the modern ‘red carpet’ treatment for special dignitaries. The scene is set. We are welcoming the Messiah – the ‘Christ’. Take time to imagine the scene, experience the hope, the joy. Can you identify with the symbols of today: the Palms, the Hosanna Cry, the throwing of your cloak? The Passion Reading from Matthew has many details. There is betrayal by close friends, the violence of crowds, political and religious leaders protecting self interests, rulers symbolically trying to ‘wash themselves of blood’. What aspect of the Passion grabbed your attention? Raymond Brown a Catholic Scripture scholar warns against a self-righteous reading and celebration of Palm Sunday and Holy Week. This week the curtain is about to come up on the drama that will ultimately change the world We are there and it is now. The Gospel is convicting. Today. Can you see how the same issues are present today. Where do you ‘fit’ in this Gospel? Judas – selling out on God for money? Fleeing disciples – worrying so much about one’s own safety? Peter – professing and denying Jesus within the hour? Soldiers – carrying out unjust instructions from above, persecuting the innocent without thought? 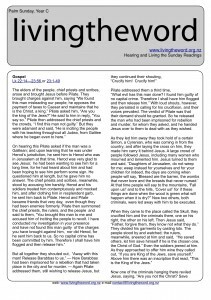 Pilate – pretending to be powerless, washing hands of justice and choosing to ignore evil? Religious Leaders – condemning Jesus and preferring the rules are kept and people are ‘safe’? Matthew has some particular details that teach us about Christ’s death. To emphasize the historical and theological importance of Jesus’ death signs expected at the end of time and history as we know it are portrayed true to Old Testament prophecy. Darkness, Elijah returning, earthquakes, the old order being overturned (raising of the just). A theological reference to the special veil inside the Temple which separated everyone from the ‘Holy of Holies’ – the place where God dwelt – is mentioned. Judaism has come to an end. The new temple, altar, sacrifice, the new dwelling place, God is now unveiled in Jesus, on the Cross. History has turned. The Old Testament is fulfilled in the New Testament. A new historical and theological order is present. A new covenant has been established. Do you see? Believe? Welcome to Holy Week. Click on the title and open this post completely into its own page. Enjoy and share with others on facebook by clicking the facebook icon at the bottom of the page. May you have a blessed Holy Week journey! Palm Sunday, Yr C – will violence win? Reflection question 4: Palm Sunday is also called ‘Passion’ Sunday as we listen to the whole story of Jesus’ personal betrayal by his disciples, his court appearance before religious and political rulers, his rejection by previously welcoming crowds, his cruel whipping and torture by soldiers. Watch, listen, feel the violence. Where does such cruelty originate from in the world? Why does the world seek a ‘victim’?